Wires are the bane of my life. I have a couple dozen trailing under my desk, another dozen coming out of plug sockets, and quite frankly it gives me nightmares about Birmingham’s spaghetti junction. Anything I can do to reduce wires in and around the house, I will do, but it’s a never ending battle. With so many peripherals come a lot of devices that are power hungry, and so cables are still a necessity. What if you didn’t need all these cables, though? Wouldn’t it be cool to throw your device down on a surface and have it charge itself? That’s what the Duracell MyGrid (looking rather like the Wildcharge wireless charger from last year) aims to do, but does it truly reduce clutter, or is it just a source of confusion to further frustrate you? Strictly speaking, the MyGrid isn’t entirely wire free; it needs to be powered itself from the plug, but it is capable of handling several devices at the same time, so it cuts down on wires that way. The grid itself is very low profile, being incredibly thin save the power line along the side where the power is connected. The top surface looks quite reflective, so it stands out a little more than some may like, but this may be necessary for the inductive charging to work, so this can hardly be avoided for now. With the MyGrid comes several adaptors, including cases specifically designed for the iPhone 3GS and older unfortunately, there was no iPhone 4 adaptor with our review unit), BlackBerry Pearl and BlackBerry Curve. If you’re not lucky enough to own a smartphone, or own a smartphone that isn’t directly supported, such as the Palm PrÃ© or an Android mobile phone, then don’t worry, you can still use the MyGrid; after all, you can charge up to four devices at once. Along with the dedicated cases, you can choose from a choice of various adaptors to power a range of other devices you may have. I was able to charge a Samsung Wave without a problem with the adaptors we were provided with, so you shouldn’t have a problem for most phones and devices. Rather than have your phone slip in to a designed case, if you’re not using a BlackBerry or an iPhone, you will have to use one of the provided adaptors, and hook it up to an additional little gizmo that allows the device to charge whilst on the surface. As a concept, the Duracell MyGrid is a sterling product, but in real use, it has a few drawbacks that the average user may not want to contend with. A lot of people choose to use cases with their phones, but I personally have never been a fan of cases. Whether you’re like me or you use a case, you’re in trouble either way. To charge your iPhone, for example, you need to put it in the case provided. If you already have a case, you have to remove your case to put the new one on, or put the new one on each time you want to charge when you’re done for the day. Once you’re done with the hassle, it doesn’t really feel like it’s worth charging wirelessly. I’d rather deal with spaghetti junction! 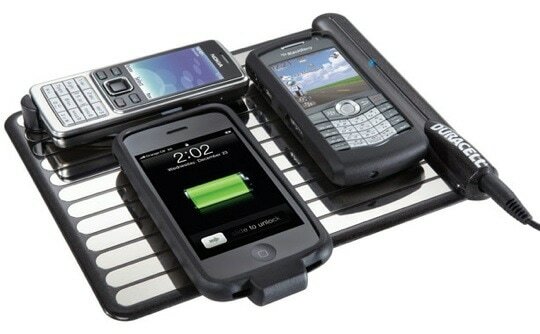 Although the MyGrid is great for all sorts of devices, I’d much rather see manufacturers include inductive charging with their devices out of the box alongside an accessory, like Palm did with the Touchstone, perhaps in time we’ll see more adoption from manufacturers. If you’re intrigued by the Duracell MyGrid though and want to try it out for yourself, you can get one for a rather reasonable £20 price point.